1 of 3 In a medium-size bowl, stir together shrimp and Greek seasoning; set aside. 2 of 3 Bring a large pot of lightly salted water to a boil. Add green beans to boiling water and simmer for 5 minutes or until crisp-tender; drain and set aside. 3 of 3 Heat the olive oil in a large nonstick skillet over medium-high heat. Add shrimp in a single layer; cook for about 2 to 3 minutes per side or until cooked through. Reduce heat to medium and add red wine vinaigrette, tomatoes and parsley to skillet and cook 1 minute or until warmed through. 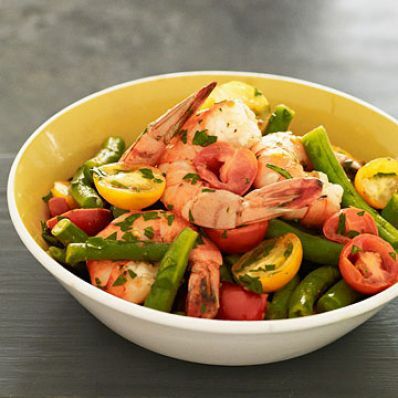 Remove shrimp mixture from heat and stir in green beans until well combined; serve immediately. Per Serving: 149 kcal cal., 272 mg sodium, 2 g fiber, 1 g sat. fat, 7 g Fat, total, 140 mg chol., 16 g pro., 6 g carb.